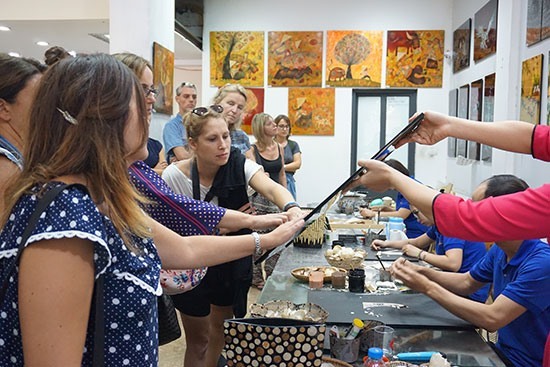 HÀ NỘI — A delegation of 25 travel businesses from Europe are seeking opportunities to work with Vietnamese partners to promote tourism during a fact-finding tour to discover Hà Nội’s tourist attractions from October 4-14. Representatives from various countries including France, the Netherlands, Switzerland, Italy, Spain, Belgium, Austria, the Czech Republic, Denmark, Norway, Poland and Turkey met with local travel businesses on Wednesday. Vietnamese travel firms presented their products to seek co-operation with partners from Europe. The Hà Nội Department of Tourism and national-flag carrier Vietnam Airlines hosted the event. The visit is a part of connection activities between tourism and airlines, aiming to boost co-operation and on-site tourism promotion through inter-regional tourism products, according to director of the department Trần Đức Hải. “It also creates an opportunity for Vietnamese tourism destinations and travel businesses to directly introduce their products to international partners,” he said. The delegation surveyed the tourist attractions and tourism products of Hà Nội and surrounding areas including Văn Miếu – Quốc Tử Giám (Temple of Literature), Việt Nam Fine Arts Museum, Hoàn Kiếm Lake, Hà Nội Old Quarter, Thăng Long Royal Citadel, Hồ Chí Minh Relic Site at the Presidential Palace and Hạ Long Bay. Barbara Leitner, a manager of Ruefa Reisen Company from Austria, said she was excited during her first visit to Việt Nam. “Hà Nội’s Old Quarter is a good place for visitors to spend time roaming around, experiencing open-air eateries and hearing the noise of whizzing motorbikes,” she said. Pinon Herve, representative of Vietnam Airlines in Paris, has visited Hà Nội about 10 times, and has always been impressed with the capital’s traditional culture and French-style architecture. He added that with huge potential and co-operation between local and European enterprises, Hà Nội will be an ideal place for European tourists. Hà Nội welcomed nearly 20 million tourist arrivals in the first nine months of this year, a year-on-year rise of 9.2 per cent. Of the total, foreign visitors were estimated at 4.3 million, up 20 per cent year-on-year, and accounting for nearly 40 per cent of the total number of foreign tourists to Việt Nam.